For Axle Whitehead one of the more bizarre contrasts of filming The Wall in Poland was during his downtime. One day he was giving away thousands of cash filming Seven’s new shiny floor game show. The next he was visiting Auschwitz concentration camp near Krakow. “It was a life-changing experience,” he tells TV Tonight. “(Auschwitz) was not that long ago. And just to see what humans can do to each other…. the men had 9-5 jobs with their wives at home and went to the concentration camp to do their 10 hour shift and went back home. What was going on was just horrific. 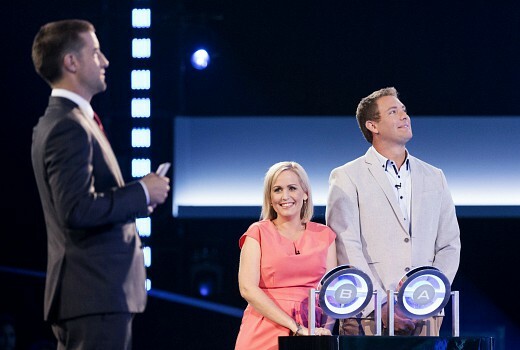 When he wasn’t delving into history, Whitehead was getting up to speed on Seven’s new show, the first show he has hosted in a decade, and the first in the game show genre. Since he wrapped on Home & Away in 2012, Whitehead has been largely based in the US, scoring a recurring role on both Shameless and Marvel’s Agents of SHIELD. 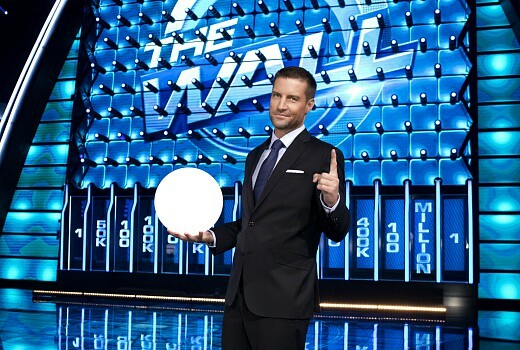 Returning home for Seven he is the smiling host of mega-show The Wall, in which contestants compete for millions of dollars (as much as $12m is on offer). But with its 4-storey wall resembling a giant arcade game, production took place on one of 3 existing sets (US and France are the other 2). “It was probably cheaper to fly everyone over there,” he admits when I ask why Seven didn’t construct an Australian set. “When we got there Russia was shooting their first season. So we watched a bit of that, which was weird. And after that was Romania, Hungary and I think Czech Republic. Describing the production period as “land, rehearse, shoot, get out,” Whitehead familiarised himself with the format playing the game with a DVD in his hotel, prior to set rehearsals. In addition to a largely Polish crew and interpreters, the crowd comprised English speaking audience & ex-pats. “So it was an interesting language barrier,” he muses. The US format show has screened in 15 countries, with the US version hosted by Chris Hardwick. 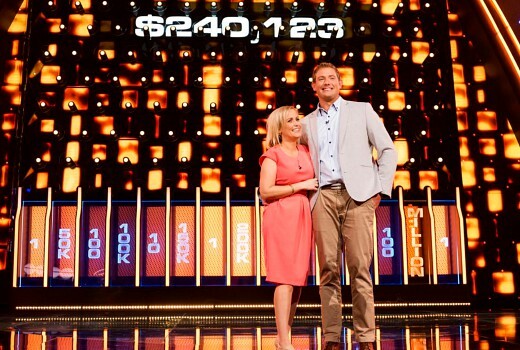 In its first episode, a whopping $240,000 was given away to 2 Queensland parents. In addition to its trivia, luck and risk, couples can wager their winnings, sight unseen for much more. Whitehead’s elaborate explanation of the gameplay was accompanied with an assurance that things are much easier to view than to explain. He also took the view that the show doesn’t trade on exploiting the ‘worthiness’ of ‘bleeding-heart contestants. “The second episode is 2 cops, where 1 is a detective and the other was the first female to be accepted into the bomb squad. So they don’t necessarily have any adversity, they just do a lot for the community,” he assured. Finally, with $12m on offer each game, how confident is he of not sending the network bankrupt? Just how fair and balanced is the gameplay? “I asked all of these questions,” he insists. “We have no control over the balls. Obviously with the trivia that has to be locked away and verified and that’s very strict. “But the balls, there is literally no way of controlling them. They weigh 1.5kilos in a bowling ball-shape. Having some of the Channel Seven guys there recording they were (very nervous). “I was watching the balls behave wondering if there was any way to rig them? But I’ve held them, put them in the chute, seen them drop time and time again, but there is no way. The Wall returns 7:30pm tonight and continues Sunday & Monday on Seven. Stilted, awkward, dreadful. I made it to the 2nd ad break. Don’t know how much the (admittedly sweet) couple won, don’t care. I started halfway through Ep 2 – it took a while to understand, and still a bit confusing – but it is interesting to see the psychology of the partner choosing to sign a contract for their winnings if they choose, but not knowing until the end. No point checking the balls to see if the game is somehow rigged. It’d be much easier to control the positioning and shape of the pegs to influence the probability of which way a ball will fall. They did land in both $1M and $1 so it seems feasible. Probably take physicist to prove otherwise. Yeah, wasn’t suggesting that the probabilities have been tweaked, merely pointing out that Axle was looking in the wrong place if they have. And his name is incorrectly spelt. Not by you – his parents. Already addressed in the story. So Axel, if it’s not about their “worthiness” don’t mention it. Just get on with it. I suspect Monday’s ep. was not E1 but specially chosen from what they have recorded. Cynical old me. And…Prime…not helpful running promos yesterday stating “tomorrow night” when it was in fact ‘tonight’. Boring, long winded, loads of palava. I watched it but l can honestly say l was not glued to my chair. I would think the questions will get harder to answer as they could not give away that amount of cash each show.